The book contained a great deal of content delivered in an engaging, animated tone. I don't think anyone could have narrated this book as well as the author himself did. I would definitely recommend. The stockdale paradox. You must retain unwavering faith that you can and will prevail in the end, regardless of the difficulties, and at the same time, confront the most brutal facts of your current reality. Whatever they might be. In order to be a level 5. You must believe yourself to be less than the idea. Encourage productive thinking. Let not be lead by ego. I learned so much from this book. I can't wait to share it with my kids. You are going to see this elsewhere as well(and the author agrees in the last chapter) a lot of this is like looking back than looking forward. But the ideas in this book do make sense and i like that. Still worth a read. 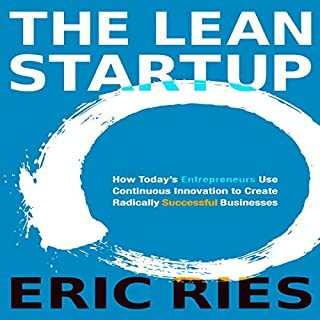 Great book about business! Wish I had read it earlier in my business but it's never too late to apply these principles. I loved the book. The only cons is the music between the chapters. 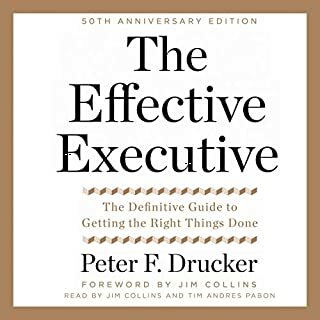 Recommend to everyone, especially managers. I wanted to read this book for many years now, but never got to it. Many of the concepts it discusses are known to me from management training programs I attended. Non the less, it was a great refresher to read them in their original context. 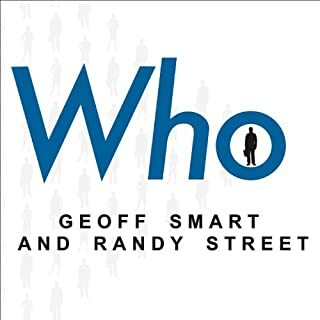 First who, then what, level 5 leadership, hedgehogs and the 3 circles. Foundational business concepts every professional needs to understand. 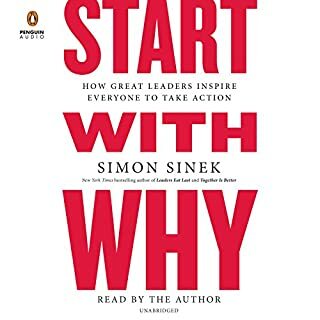 This book is one of the best business books out there. 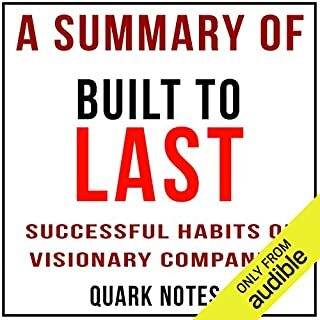 I recommend this to anyone trying to take their performance to the next level. Décomposé en plusieurs chapitre de 45min, chacun abordant un trait de carractère/ un concept/ une habitude. L'étude touche les companies et CEO et leur rentabilité sur les marchés, cependant un lecteur pourra faire le lien et aquérir des concepts. Second livre de Jim Collins dans sa sage, (precedent : Build to Last). L'auteur insiste sur le fait que ce livre devrait être lu en premier. Les passages sont rythmés, ni trop long, ni trop court. if you can get past the list of 'great' company's that haven't done that great. its a worth while read as it is so frequently referenced (often badly) in current literature. I think the basic message of this book that the right type of simplicity is very hard but very worthwhile is still valid. Yes, the narrator is the author, so maybe that counts for something. But man, he just goes so far over the top over-weighting his words so often, it's pretty comical at times. The sample is a bit misleading, because Collins is just getting warmed up in that. A few more pages in, and He Is Speaking Like A Triumphant Graduate Student Who Has Just...Found...The...PROOF...That...Discipline -- DISCIPLINE! -- is the Key! Narrative comedy aside, there is a lot of worthwhile information here, though when you boil it down there's a lot of the obvious here. Also in late 2010 the discussion of Circuit City and Fannie Mae as "great companies" is a bit ridiculous; and some of the companies discussed as great have attained their greatness in part by less-than-moral means that have come to light in the years of increasingly ubiquitous internet since the book's publication. Still, Collins' articulation is highly accessible and well-ordered, making "the obvious" easier to digest and retain. 4 stars for content, 2 stars for narration = 3 stars. Yes. 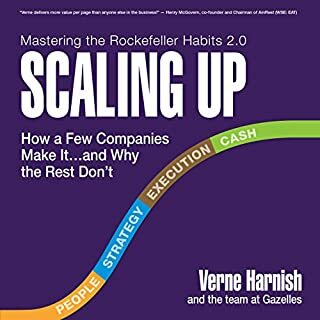 No matter if you are an entrepreneur or an aspiring corporate executive, this book has great ideas that can apply in your business life. Must read. 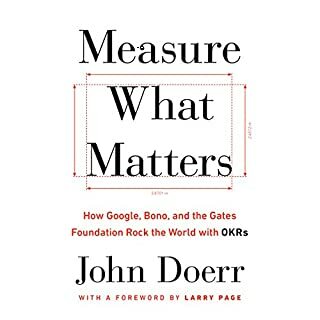 Despite its research-based background (which gives it much validity), Jim Collins narrates and brings the book to life, even when describing their research methodology. How to book for abolishing complacency. 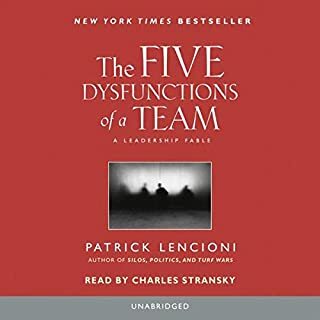 This is simply a must read for any leader who struggles with taking their team to a new level of productivity. The hardest part of going from good to great is when no one else has done what you are trying to do. 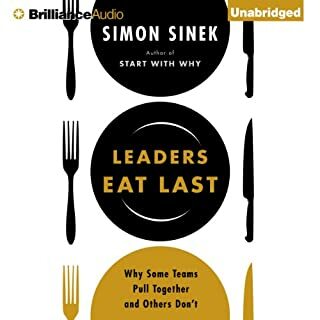 This book provides some very simple principles giving you a roadmap to help you and your team understand what should be your main focus. 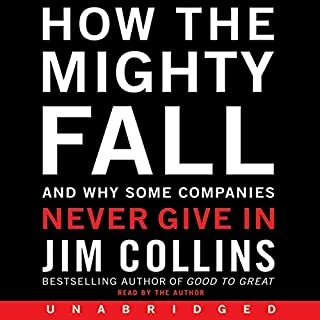 What was most disappointing about Jim Collins’s story? The books starts off with a great promise. 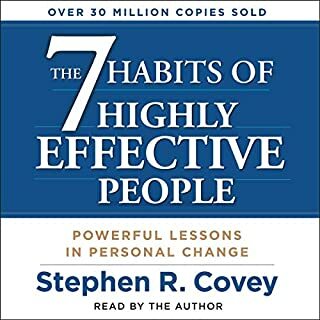 Unlike the usual "7 habits of successful people" and "10 steps to success", the author announced right away that his study was properly conducted, it has a control sample, and that the book will not only talk about commonalities of the "good to great" companies, but will also talk about the NECESSARY and SUFFICIENT characteristics (not just necessary) and that it will discuss what "good to great" companies have that "good" companies don't and vice versa. The author also promised not to fall into the trap of "if you can't explain it, blame it on leadership". 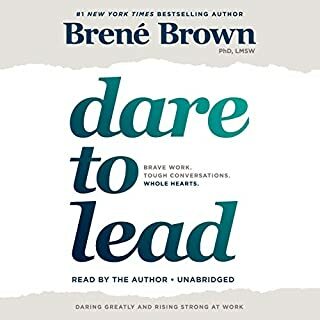 The book turned out nothing but hours and hours of repeating the same main idea: it's all about the leadership. If you can't explain it, blame it on leadership. The only difference, the author invented a clever way to mask this obvious shortcoming by talking about "level 5" leadership. 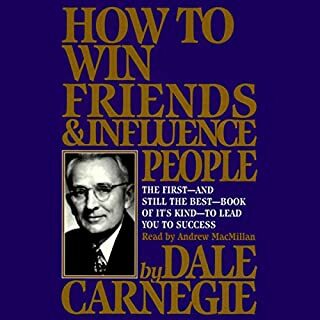 What that is is "putting company first", "being modest", "working hard", "making the right decisions", "having the right people" and other very trivial and useless advice. What the "right" people or the "right" decisions are, of course, depends on the specific case, so not much attention is devoted to that part. 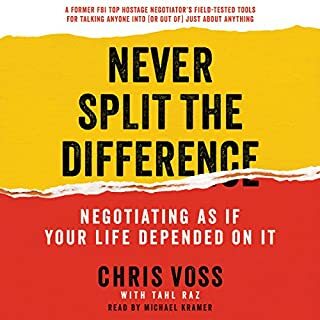 The book is written in the language that you would hear from a professional consultant who charges a lot and tells you what everybody already knows, but in a language that makes it sound impressive and evidence based. Still, it all boils down to having the "right" leadership, making the "right" choices, having the "right" people, working "hard" and other common sense. I thought this part was over, but even after my coffee and breakfast, the author is still over emphasizing their research methodology and speaking of how they "pounded on tables" and other debate action with each other about the book. I continued to listen anyway, then I found him listing out another dry and boring laundry list of companies. When telling a story, Stephen King Points out: "don't tell us a thing, when you can show us" in his book On Writing. The author is "big" on telling us instead of showing us, effectively robbing the reader/listener of the experience of the discovery that a good and interesting story brings. I want to "discover" profound things as I go along, not names thrown at me all at once. He is still rambling about research methods at the 30 minute mark. "We call ourselves the chimps, in honor of our mascot Curious George" speaking still of how great their efforts were in their producing the book at the 32 minute mark. He speaks to us about the steak when we want to hear about the sizzle, let us taste the steak, not give us a molecular structure breakdown of it. Highly boring, this self-back patting is, I feel. I want to learn the unique information, not how hard they worked with Curious George cliché'(s) and table pounding meetings. I get it... move on! 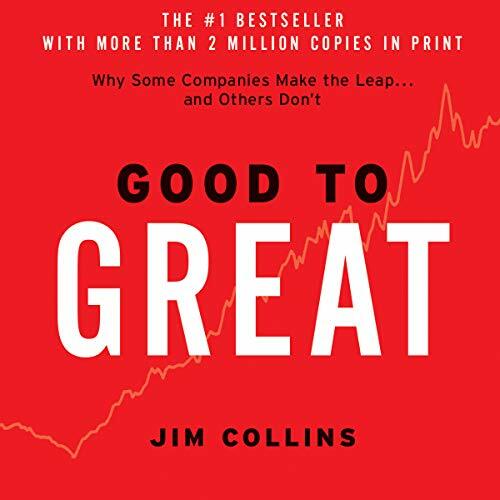 What did you like best about Good to Great? What did you like least? 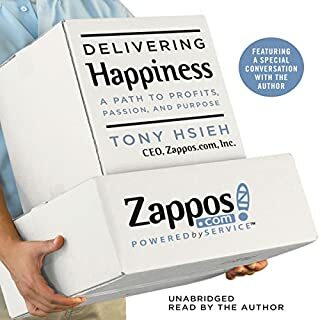 There was some good concepts in this book and I enjoyed learing about other businesses; however, each topic was overbaked. I kept thinking to myself, "ok, I've got it! Get the right people on the bus... ok... move on already!" It was hard to stay focused during parts of this book. 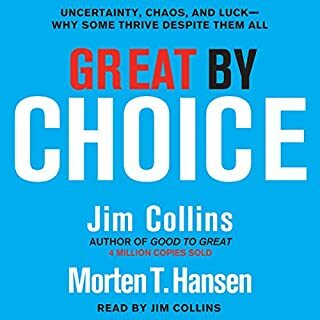 What made the experience of listening to Good to Great the most enjoyable? 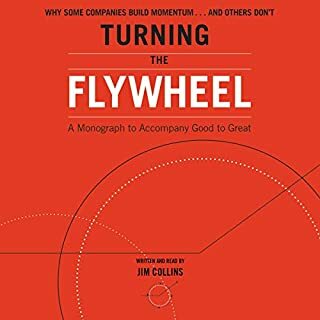 Jim Collins really is enjoyable to listen to, the way he reads is the way he intended this book to be read, the passion and enthusiasm he puts forward during the read makes this audio engaging and exciting. I continue to listen to this over and over. The fact based findings and how simple it is to see how companies make the leap from Good to Great. Have you listened to any of Jim Collins’s other performances before? How does this one compare? This is my first listen but I will be enjoying many more since having picked this up. 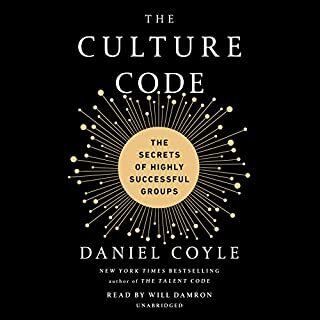 I had heard this book had great info in it, but dry to read. Listening was a great way to get the info. The author's passion for this topic draws you in, given he reads it, and it engages you in the story. Recommend it! I feel with all the readily available 'inspiration' online, there wasn't a ton of value here. Disappointment in not choosing a better read.